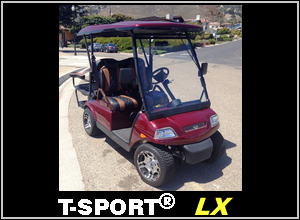 Before contacting ACG, Inc. about purchase of any of our vehicles, please acquaint yourself about the difference between Low Speed Vehicles (LSV) that are also referred to as Neighborhood Electric Vehicles (NEV), electric Golf Carts (eGC) and Estate Electric Vehicles (EEV). 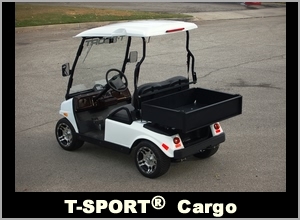 Click the links below to navigate to detailed web pages that explain the difference. 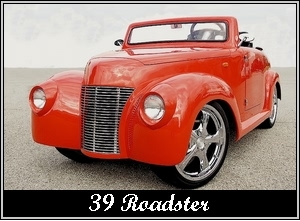 Click on any image above or any link below to navigate to detailed web page. 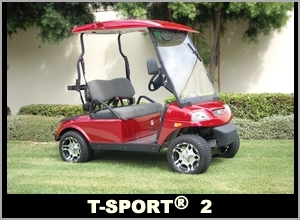 Click on image above to navigate to detailed web page. 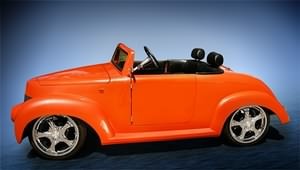 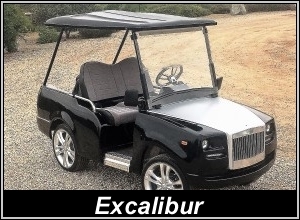 American Custom Golf Cars, Inc. also known as ACG, Inc. has been involved in the design & construction of Electric Cars including movie cars, "one-off" custom cars and high quality automotive accessories since 1976. 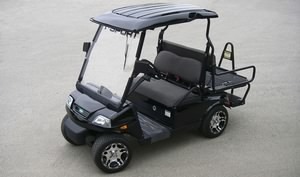 ACG currently manufactures electric Golf Carts, Neighborhood Electric Vehicles and Estate Electric Vehicles. 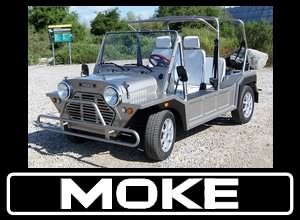 ACG MOKE™ is available as NEV. Standard seating is for four. 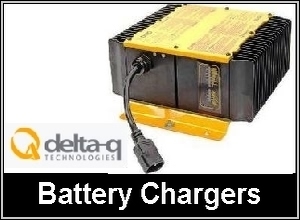 Click on the image above or the link below to navigate to detailed web page. 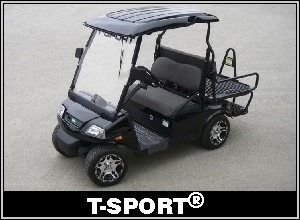 ACG T-Sport® NEV is available as either 2 or 4 seat version and confirms to the latest FMVSS for Low Speed Vehicles (LSV), therefore in most States it can be registered for used on Public Streets. 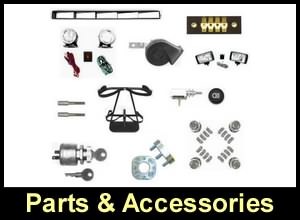 Click on the image above or the links below to navigate to detailed web page. 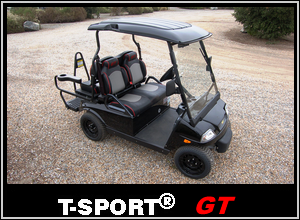 ACG California Roadster® is available either in Golf Cart (eGC) or NEV versions. 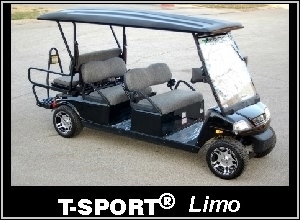 Standard seating is for two, but can be custom made as a "limo" in either 4 or 6 seat versions. 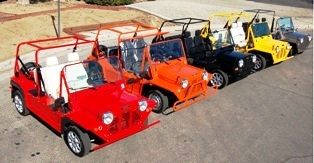 This unique vehicle designed in 2000 by Ray Hoogenraad and is protected by U.S. Design Patent. 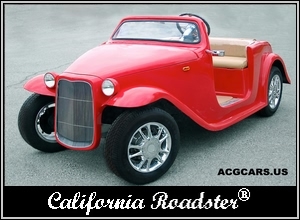 ACG 39 Roadster is available either in Golf Cart (eGC) or NEV versions. 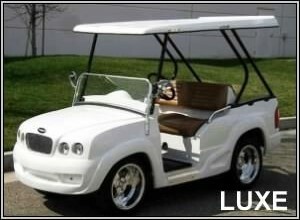 Standard seating is for two. 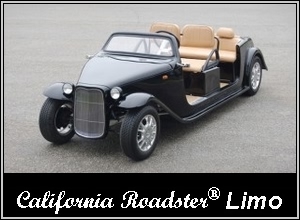 Send mail to info@californiaroadster.com with questions or comments about this web site. 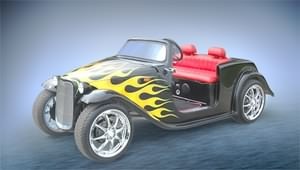 Copyright © 2012-2019 ACG, Inc.